We carry aluminum partition headrail in a variety of widths and lengths. We also offer headrail brackets and end caps to complete the project. Our assortment of hinges includes gravity, spring loaded, vault, wrap around and integral hinges. Available with or without fasteners. Choose from hundreds of individual toilet partition brackets, or select a bracket pack that is customized to your specific requirements. Available in Aluminum, Stainless Steel, Cast Stainless Steel and Chrome Plated Zamac. We have door hardware for any job. We carry latches, strikes & keepers, as well as door hooks, stops and pulls for every material. We carry all-inclusive door hardware packs with hinges for both metal and plastic laminate doors. We offer partition shoes with integral heels as well as shoes with separate heels. Our selection contains shoes for all materials, including metal partitions. All shoes come with their required fasteners. 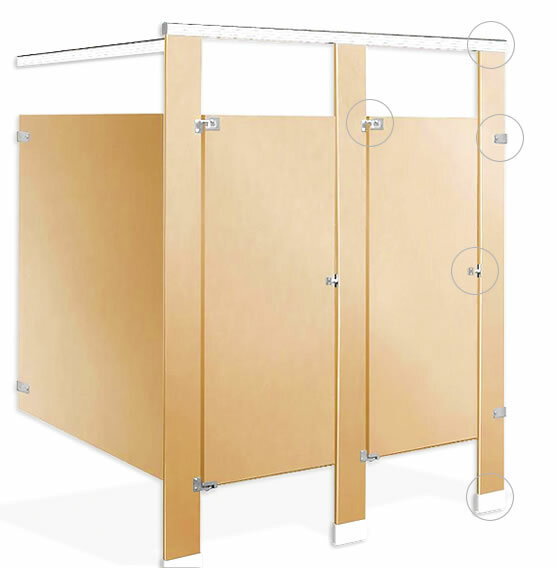 "The Standard of Quality in Toilet Partition Hardware"
Prefer to Order via Fax?